Jeesh, everything’s so serious these days … or stupid. Either way, it’s been too long since we forgot to tell you about the latest from The Micros. It really was a funny episode a month ago. But like always, lol because it’s true! And we have a bonus late episode — the Micros’ pitch for people to vote for them in the 2011 Bluff Readers Choice Awards, where Rose, Chase, and Tommy somehow got lumped in with all the podcast/video/live radio newsy shows (in the category The Poker Beat always dominated) and cleaned up. Enjoy, if you haven’t already. “Sometimes in life a person can feel lost and wake up one morning not recognizing who he is. Last summer that was how I felt. Prior to winning the WSOP in 2008, my life was very much a good solid routine of playing online poker and hanging out with my friends and family. Winning the WSOP changed that. I relocated to London and started a new life, the life of a high profile poker pro. For almost 2 years I was in a constant spotlight, travelling from poker tournament to poker tournament, doing thousands of interviews and never had a chance to catch my breath. In the whirlwind that followed winning the WSOP I lost track of the most importing thing in my life, myself. Last summer I decided that I wanted to stop playing poker and catch my breath and find out who I am and what I want to do with my life. Over the last 8 months I have had a chance to reconnect with my friends and most important, my family. I have spent quality time with my family and really had an opportunity to figure out who I am and what I want to do with the rest of my life. When there is no financial pressure it can sometimes be hard to get motivated to move forward as a person. I truly enjoy playing poker. I love the competitive element and the mental challenges of tournament poker. I feel it is important to constantly grow as a person and for a while I didnâ€™t feel I was moving in the right direction. Having had time to think about my life and future I feel I have figured out how I can combine playing poker with a healthy life outside of poker. I do not consider this a comeback, as I always knew there was a good chance I would play poker again. During my hiatus from poker, PokerStars have been very supportive. Therefore, I am pleased that I will start out with playing two events where I will be sponsored by PokerStars. First, I will be playing the PokerStars.com EPT Copenhagen which of course means a lot to me, since it is on my home ground. Then I will play the NBC Heads Up Championship. I am fortunate that PokerStars have the best online tournaments, so I have an opportunity to get back in tournament shape. Interesting + cool … now the first ever November Nine winner can be more like all the rest who have come since then, but different because two months ago he became the only November Nine-era champion old enough to rent a car in Vegas. NOTE: Turns out “devaluate” is a real word. Who knew? The now two time fan voted “Favorite Web-based Poker Show” award winning Poker Beat is going out on top with their 95th episode being their last one. Ashton Griffin Runs 70 Miles. High Stake Poker’s New Host. BLUFF’s Player of Year Points Restructure. The panelist discuss the new UB and break down 2010 in the latest episode of The Poker Beat. WSOP days will end after 10 levels. Annie & Phil part ways with UB. Prahlad Friedman to sell out? Top Poker Stories of 2010.
for Favorite Web-based Show in Bluff magazine’s 2010 Reader’s Choice Awards. Antonio Esfandiari wins WTP Five Diamond. Bluff Magazine Reader Choice Awards Votes? BJ and Dan go heads up on the implications of the proposed Reid Bill + Who is the Best Canadian Athlete in the World? Jonathan Duhamel the best athlete in Canada? Harry Reid online poker bill WTF? Jess Welman only finished in 8th place in Event #1 of the Detox Poker Series for a $3k score. But it was the biggest of her career thus far, came with an ROI of infinity having won her seat in the media freeroll, and already she’s gotten more press than the 8th place finisher of the November Nine will likely get. Big ups to the best red-headed co-panelist on The Poker Beat … who also happened to be the only player in Event #1 to show up with muffins. Getting caught up and back in the swing of things — slowly but surely — so what better way than to listen to the most recent episode of The Poker Beat? * great explanation, BJ. But question … Is there any discernable line where the “field of play” in poker begins, and ends? Next ep coming tomorrow. Play along in the PokerRoad forums. The Poker Beat’s Huff-honcho was away crafting his life and future … so I somehow, as a third- or fourth-stringer, commandeered the hosting chair. Think I can now lay claim to being the Glen Carano of poker podcasting! With @JessWelman, @BJNemeth, and new-to-twitter @GaryWise1 providing analysis and reality checks, we got into Israel’s sudden crackdown on online gambling, the WSOP-Circuit revamp, and of course, the latter stages of the 2010 WSOP Main Event … along with the WPT Season 9 overhaul, which happened to be getting underway across the highway at Bellagio, in rather star-powered fashion. We swear we’re not gonna get totally self-indulgent here at Pokerati … just maybe on weekends a little bit. After all, you really do care about the people who bring the WSOP to you, or you to the WSOP. If not, all of us shoulda probably found new lines of work long before Moneymaker gave up his title as defending champion. While recording an episode of his other podcast, The Poker Beat, in the Amazon hallway, Dan was interrupted by a phantom beauty kissing him on the forehead before she slipped into the Amazon poker fray. Dan’s not-so-good peripheral vision prevented him from properly IDing his fawning female admirer. 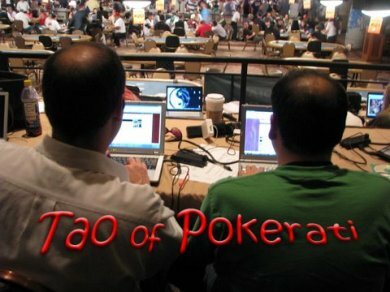 During this episode of Tao of Pokerati, Pauly gives him advice on finding out the identity of the kissing bandit, who gave him false brief hope that he may some day find love and meaning — or at least quick-n-hot nookie — at the WSOP.